SAINT Ignatius Parish priest Charles Chilinda has called for forgiveness, reconciliation and love among Zambians despite the political and regional divide that has emerged following the August 11th general elections. 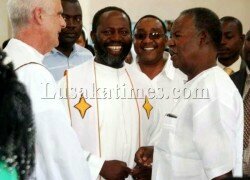 Father Charles Chilinda said the church was disturbed with the growing trend of regional voting that characterized the polls and advised that the political leadership from both the opposition and the governing should ensure there reconciliation among Zambians so that harmony could continue. He said all people were equal in the sight of God and that what distinguished good leaders from the bad ones was honesty and humility. In Bwengwa, two families have been evicted from their homes and have been told to leave Monze on suspicion that they were supporters of the PF. Equally in Pemba however, White Chisi, a Principal at Kasiya Bisiness and Secretarial College and his entire family have been chased on account that he was a presiding officer for Pemba district where the UPND won all the parliamentary seats. Mr Chisi narrated to the Daily Nation that he was forced to leave Pemba by UPND cadres who had threatened to kill him and his entire family. In Batoka, the displaced families have appealed to Government to deploy more law enforcement officers in some villages of Southern Province as non-Tonga speaking people are being victimised while their houses and goods meant for business were being burnt. One of the victims Agness Mulenga, a trader of second hand clothes in Batoka, complained that she had her house and goods burnt for allegedly not being a sympathiser of the opposition UPND.